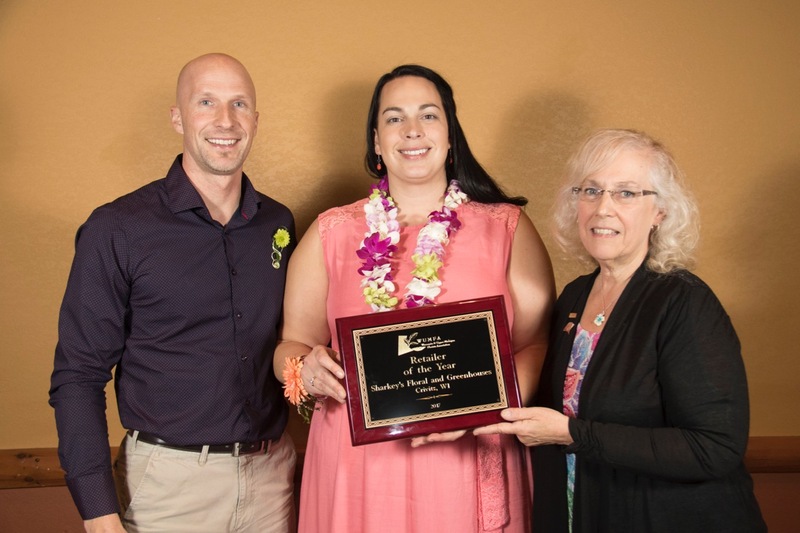 Sharkey’s is WUMFA Retailer of the Year Amy and Scott Sharkey, Sharkey’s Floral and Greenhouses, Crivitz, Wisconsin, accepted the Retailer of the Year award at this year’s Wisconsin & Upper Michigan Florists Association. The honor is given to a member of WUMFA who has done an outstanding job as a florist. The floral business began in the late 60s when his parents began selling a few buckets of flowers. The flower shop was expanded and greenhouses added. After the parents retired the business was sold to another family. But when it came up for sale in 2005, Amy, who has earned her Certified Florist designation, and her husband Scott decided to buy it back. In 2007 they added a commercial apple orchard and then started another business, Beat Your Neighbor Fertilizer. The fertilizer which they use in the greenhouses has grown from a side business to a national entity which has tripled in sales volume. Shop Local…Shop Early For Valentine’s Day Flowers!